Sonia Rykiel for H&M was the last time I jumped in my seat from joy and excitement of new designer collaboration...Well until now that is. Marni for H&M collaboration makes me very happy! From the preview pics I can see their customary art deco prints and some fabulous acrylic costume jewelry which hit stores in March 2012. 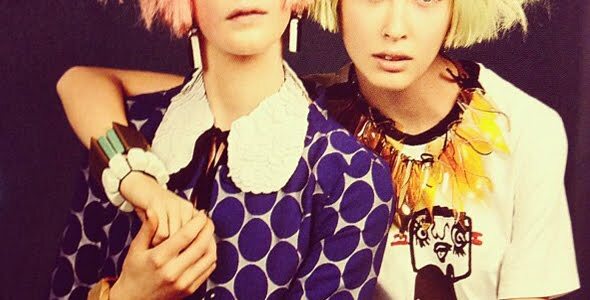 I have a couple of necklaces from the original range and nothing adds a whimsical twist like Marni fashion bling. Oh and it's definitely worth bagging the above adorable t-shirt – proceeds from sales go to Japan Red Cross. Check out more of the looks from this collection in commercial by Sofia Coppola here. Oddity of the Day: Soleless shoes anyone? Marni for H&M Lookbook released! Jason Wu for Target launched today!